Many times while writing about these 10 qualities so crucial to being an enduring and endearing leader, I’ve discovered something that startled my predictable way of thinking, encouraged the deeper places in my heart, or inspired my sagging hopes. There were also times when the bigger revelation was just how Jodi-hearted I am, instead of how Jesus-hearted I should be. As we make more room for Jesus in our lives, He transforms our hearts, develops the qualities we need to serve Him best, and ultimately brings us to fullness. This, too, is a long journey with many twists and turns. But His Spirit is navigating our steps, and He knows just how to get us there. 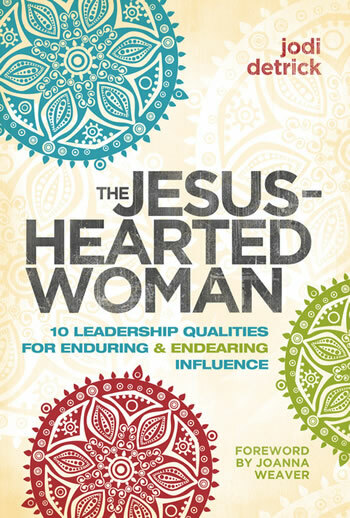 Detrick outlines “10 qualities of Jesus-hearted leadership” in the excerpt, qualities that apply as equally to Jesus-hearted me as to Jesus-hearted women. They are confidence, authenticity, humility, stamina, resilience, courage, self-awareness, kindness, soul care, and vision. In this video, I interview Doug Clay about his new book, Dreaming in 3D. Clay is general treasurer of the General Council of the Assemblies of God. In this video, I interview Brian Dollar, author of I Blew It! The Biggest Mistakes I’ve Made in Kids’ Ministry…And How You Can Avoid Them. In this video, I interview Mike Clarensau about his new book, From Belonging to Becoming: The Power of Loving People Like Jesus Did. Mike is senior director of the Healthy Church Network. Prior to that, he was senior pastor of Maranatha Worship Center in Wichita, Kansas. From Belonging to Becoming charts a new pathway of discipleship. Instead of believing-belonging-becoming, Mike argues that Jesus practiced belonging-believing-becoming, putting relationship before the call to faith or the commitment to a new lifestyle. Indeed, the relationship with Jesus made both faith and holiness possible in the lives of Jesus’ followers. This is the model of discipleship we too should follow. I reviewed Mike’s book here. 00:28 The “assimilation process” at most churches looks like this: believing-becoming-belonging. In this book, you argue that belonging comes first: belonging-believing-becoming. How did you come to the realization that most churches’ “assimilation process” has things backward? 05:39 Throughout the book, you use the story in Luke 7 about the sinful woman anointing Jesus’ feet at the home of Simon the Pharisee. There are three main characters in the story. There are also two ways of responding to the sinful woman and two ways of responding to Jesus. What are those ways? 08:45 Why is so hard for pastors and church members to realize that their ways of responding to “sinners” are often more like the Pharisees’ than like Jesus’? What are the rationalizations we offer for our ways of responding, and why are they wrong? 12:28 What do you mean by “belonging”? Does it involve putting nonbelievers in positions of leadership at the church? 15:16 John Maxwell says that people don’t care what you know until they know that you care. Is that true? What do you mean when you say, “Once that people know that you care, they care what you know”? 18:00 Throughout the book, you share your own personal journey of discovery on this matter. How did your specific context in Wichita, Kansas, help you make this discovery? 22:02 Are you really saying that there aren’t moral absolutes or things that the church should be known for? 25:12 Isn’t it a lot more easy (and fun) to denounce sin than to redeem the individual sinner? 26:50 Is belonging-believing-becoming a methodological approach to helping people experience the wholeness of life Jesus offers? 28:36 All of this sounds like that “seeker sensitive” stuff. Doesn’t the Bible describe the gospel as an offense? 31:10 The book complexifies our thinking by forcing us to realize that much of what we do at church is more Pharisaical than Jesus-like. It forces us to ask, “What kind of Christianity am I actually practicing?” What’s the difference between becoming like Jesus as opposed to becoming like other church people. 33:31 Part 2 of the book describes the shift of thinking church leaders must experience to begin to welcome the “sinful woman” into their community as Jesus did. What does that shift look? 36:46 What can pastors do to begin to forming friendships with people outside of church? 39:19 What about the objection: |”We don’t want ‘those people’ around our kids”? 41:22 What can we do to be more friendly to people who begin to attend our church? 43:45 What should church leaders take into account in their “assimilation process”? 46:31 What is “congregational astigmatism”? How do we overcome it? 49:00 What is the Healthy Church Network? Where can people get more information about it? Mike Clarensau, From Belonging to Becoming: The Power of Loving People Like Jesus Did (Springfield, MO: Influence Resources, 2011). $19.99, 262 pages. Luke 7:36–50 narrates the encounter between Jesus and a sinful woman who anointed his feet at the home of Simon the Pharisee. Mike Clarensau opens From Belonging to Becoming with this story because it illustrates a choice all church leaders and members must make: Do we accept the woman as Jesus did, or do we reject her like Simon the Pharisee did? Clarensau is senior director of the Assemblies of God’s Healthy Church Network. Before taking this position, he was senior pastor at Maranatha Worship Center in Wichita, Kansas. It was during his tenure as pastor that this passage in the Gospel hit him with the force of a revelation. Raised in church his entire life, working as a vocational ministry his entire adult life, he realized that much of the way he thought about and ministered to unbelievers reflected Simon the Pharisee’s perspective more than Jesus’. And he noticed that this was true at other churches as well. The “assimilation process” at most churches—that is, the path by which nonbelievers become fully committed followers of Jesus Christ—looks like this: believing, becoming, belonging. In other words, you believe in Jesus, become like Jesus, and then you can belong to our church. With the sinful woman who anointed Jesus’ feet, the “assimilation process” looked radically different: Jesus’ acceptance of her—i.e., her “belonging” to him—made possible a change in her believing and becoming. John Maxwell likes to say that people don’t care what you know until they know that you care. Clarensau agrees with this and adds: Once people know that you care, they care what you know. In other words, building loving, Christlike relationships with people helps them become fully devoted followers of Christ. Hence the title of his book: From Belonging to Becoming. Clarensau divides the book into three parts. Part 1 explores how we view the “sinful woman” when she comes to our church. It exposes the Pharisaic rationalizations we offer for excluding her in contrast to Jesus’ practice of welcoming and including her. Part 2 offers insights into how our vision of church would change if we looked at it from the perspective of the sinful woman. And Part 3 offers practical advice for creating an “assimilation process” that puts belonging first, without sacrificing either believing or becoming. In other words, both doctrine and practice must be part of following Jesus Christ, but assimilation begins with loving relationships. I heartily recommend this book to pastors, church leaders, and lay ministers who want their churches to become Christlike not merely in what they teach and in their manner of life, but also in the way they do church. Whether they agree with everything Clarensau recommends, they will his reading of Scripture and practical sights challenging to status-quo ways of thinking and doing. In this video, I interview Pastor Rod Loy about his new book, “3 Questions: A Powerful Grid to Help You Live in the Grace of God.” Well, that was my intention. We actually ended up talking about the book as well as a lot of other topics. Enjoy! 01:11 How can a pastor wear a pink shirt?” & other crazy questions pastors are asked. 02:15 How do you protect your super-secret identity as Rocketman? 03:30 What are you doing Christmas Sunday morning? Are you having service? Why or why not? 07:12 What advice do you have on parenting? 10:30 Your book is called 3 Questions. What are the questions? What are they about? And what motivated you to write this book. 16:30 Which of the three questions was most difficult for you? 18:48 At this past General Council, you called the question on Resolution 20 to consolidate the Assemblies of God’s three national schools: AG Theological Seminary, Central Bible College, and Evangel University. Do you feel comfortable having called for the question, or are you worried that there are still unhealed wounds in our Fellowship regarding the GC decision to consolidate the schools? 23:57 How should a pastor use social media? 29:02 What’s on your heart regarding missions? Where do you see AG missions going? 31:17 What’s your biggest concern for the next generation of Christians? Non-Christians? 34:53 With your schedule as a senior pastor, how do you stay connected to the next generation? 36:42 What do you see as the biggest challenge facing the Assemblies of God? 38:43 What kind of book is 3 Questions? A discipleship book? A self-help book? 41:21 What advice do you have for people just starting out in vocational ministry? 42:35 What should I do to get a coach/mentor? 45:15 How doe please God in a people-pleasing culture? 46:55 Where do pastors and church leaders need to be more courageous? 48:33 What’s been your biggest surprise since becoming a senior pastor? 49:46 What’s been your biggest surprise about becoming an executive presbyter?